News, and Other Four-Letter Words. When you’re a writer, and one of the country’s best literary festivals is on your doorstep, you can’t help but pop your head around the door. The Dundee Literary Festival closed yesterday after five days of events. The highlights included Dundee International Book Prize winner Amy Mason, BBC Scotland political editor Brian Taylor choosing his favourite books, the STV Digital Spark Award to develop a Web-based project, topped with off with Sonny Carntyne performing ‘alt echo rock’ and novelist Zöe Venditozzi with her hilarious antidote to a hypnosis CD. For a more in-depth flavour of the programme, visit their Twitter account, Facebook page, and the Dundee University Review of the Arts (DURA) blog. If you only look at one thing, make it The News Where You Are by James Robertson (below). I had a debate with one of the DURA bloggers over whether it was a story or a poem, but it’s a hilarious satire about what is implied when the national newsreaders hand over to the local newsrooms. This year, I’ve become Municipal Liaison for National Novel Writing Month in Dundee. I arranged our Kick-Off Event to coincide with the festival. It’s impossible to tell how many people will come to a given event, but we ended up with ten members altogether, and we listened to last year’s MLitt graduates each reading his or her magnum opus. Our regular write-ins will begin on Saturday, and I’ll no doubt write more about these throughout November. 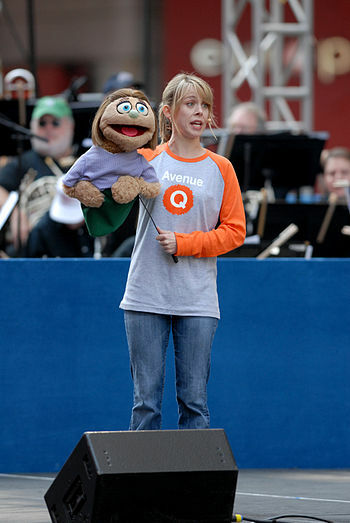 In between all that, I found time to see Avenue Q, the show that’s broken out of Broadway and crossed the Atlantic. The actors stand on stage and sing alongside the puppets, but this soon ceases to be a distraction as they settle into the story of a new graduate coming to town, Kate Monster’s fight to have monsters recognised in society, and Rod’s reluctance to admit his sexuality. Content-wise, there is very little actual swearing. If this was a film, it’s the adult concepts that would probably earn it a 15 classification. It’s also hard to see why Teenage Mutant Ninja Turtles, which I also caught this week, was given a 12A rating, when I could find nothing that would it earn it any more than a PG. I don’t often swear in my own writing. The intention is often to shock, but when everyone does it, the words lose their impact. Comedian Bill Bailey summed it up nicely when he compared effing and jeffing to road humps: one or two isn’t an issue, but a constant barrage is. By contrast, Quentin Tarantino takes the view that, “I’m a writer, no word is in jail,” but from watching his films, I do see the F- and C-words being given more parole than any other. But in the right hands, swearing can be done well. I’m thinking mostly of John Cooper Clarke’s Evidently Chickentown, in which the F-word appears 83 times to produce an onomatopoeic effect of a chicken’s squawking. When he recorded it in the early 1980s, though, he had to replace 80 of these with bloody. I was going to end this entry with a word that sounds a bit rude, but I shan’t. I promised in my last entry that if I had the opportunity, I would memorise one of my poems and perform it the following Friday. Speakerbox is a new event for writers and poets at Dundee University union. During a chat with the organiser, she told me she hopes to hold it every month. She has also been to the existing Hotchpotch meetings to share her material. I was asked to read first, and I have some footage of how it went. The purple mood lighting made this stage look fabulous in person, although not so much through a camcorder. I hope this event continues, as I plan to be back next month. During the week, I also had a much rarer opportunity to be in the audience at a recording of a Mrs Brown’s Boys Christmas episode. 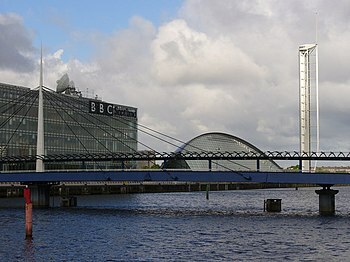 Although the story is set in Ireland, it’s filmed in Glasgow. In many respects, it’s a standard sitcom, except that many of their bloopers and ad-libs make it into the final programme. There were a number of these during the three hours we were in our seats. Many scenes were recorded twice in succession. I found I was watching the monitors rather than the action on the set, so I deliberately tried to keep my eyes away from them to catch the full experience. Agnes Brown is played by Brendan O’Carroll who also writes much of the material, but it’s accessible scripting that doesn’t require the audience to understand any particularly Irish references, so it plays very well to a BBC1 viewership. It’s less well-known that he is also a novelist. In 1999, his book The Mammy was made into film called Agnes Browne, starring Anjelica Huston as the eponymous character. Unlike the sitcom, these take a sombre tone. Also worth a look is What We Did On Our Holiday, starring David Tennant and Billy Connolly. It’s written by Andy Hamilton and Guy Jenkins, the force behind Outnumbered, although I’ll always remember them primarily for satirical comedy Drop The Dead Donkey. The duo have found a particular niche in giving the child characters all the best lines, often relentlessly, while the adults fumble for an answer. The coming week is a busy one for me. Not only is the aforementioned Hotchpotch happening tonight, the Dundee Literary Festival also begins on Wednesday and runs to Sunday. At the same time, I’m organising the first meeting of the local National Novel Writing Month group, finishing my library books, and still taking time out to see Teenage Mutant Ninja Turtles at the cinema. WordPress informs me that I’ve been writing on this site for exactly a year now. Thank you very much for joining me over the last twelve months. I’d like to start today with a little more recent history. Two weeks ago, I watched a TED lecture about the techniques anyone can use to improve their powers of recall. It seems that humans are kitted out with excellent spacial and visual memory, and it’s much easier to remember something when it’s associated with a journey or the layout of a building. TED lectures themselves are traditionally delivered without notes. 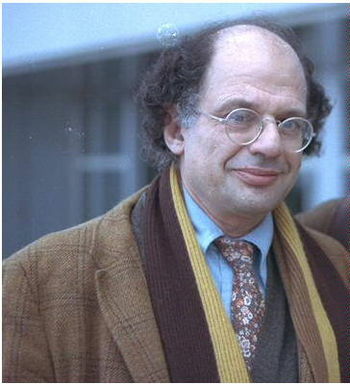 You might remember that I discussed plausible and implausible coincidences, but it so happens that I was walking home that evening when I decided to listen to Allen Ginsberg‘s iconic poem Howl for the first time. His recordings are available on Spotify. I’ve read it several times but that is the first and only occasion I’ve heard the recording so far. Yet a fortnight on, I can recall the journey. Moloch! appeared over and over. I was with him in Rockland. One piece of advice often given to writers is to keep a notepad by the bed for good ideas. I’ve done this for years and I can still count on one hand how many flashes of inspiration I’ve had at 2am. What works for me is being active, particularly going for a walk. I think the spatial memory concept is part of the reason why walking works wonders for ideas. As you amble, the brain is observing everything around you, which makes associations and triggers off memories. Please do ask for a second opinion about that theory from someone who’s qualified in these matters. One of the great elements of being a poet – or indeed a prose writer – is that you aren’t normally expected to memorise your work. A rock musician doesn’t look at the chords as he’s performing to Wembley Stadium, a dancer on the West End stage doesn’t refer to the steps in her hand, but a poet is permitted to read from the page. I have seen poetry recalled successfully from memory many times, but the occasion that stands out most was Alan Bissett. He not only performed two or three pages of a play without prompting, but acted out both parts by just the tone of his voice. Last place goes to Labour Party leader Ed Milliband MP, who forgot to mention immigration or the deficit in a recent speech. I know only one of my poems by heart, but it’s the manageable length of eight lines with eight syllables each. My longest poem is a 120-line free verse piece called Anatomy of a Party. In the first draft of this post, the last sentence of that last paragraph was, I could, and probably should, learn it using the Memory Palace technique as described in the TED talk, but there seems little point as I’d usually have it in front of me. But then I took a second thought. There’s an event on Friday where I plan to read Anatomy of a Party and two much shorter pieces, time permitting. I wonder whether I could memorise one of the shorter pieces for that day. I offer no guarantees, but I think I’ll make an attempt. I’ll report back next Monday. From Thursday to Saturday this week, Nassim Soleimanpour’s experimental play White Rabbit Red Rabbit will be performed at the Traverse Theatre in Edinburgh. Siobhan Redmond, Phill Jupitus and Ewen Bremner will have had no direction, no rehearsals, and no idea of what their lines will be. Instead, the script is placed in an envelope that will be opened in front of the audience just before the performance begins. The play’s structure was influenced by the sanctions against the writer. He is a conscientious objector against military service in his native Iran, and is not allowed to leave that country. A symbolic empty seat is left in the front row of each performance. I’m in the habit of listening to The New Yorker fiction podcast, where authors perform other authors’ short stories and are interviewed about why they like what they’ve just read. A couple of months ago, I encountered Donald Bartheleme for the first time through his story Concerning the Bodyguard. This piece is experimental in a different way, narrated through a series of questions, repeating nouns where a pronoun would normally suffice. Salman Rushdie read it, lending an extra edge through his measured baritone voice. It took until the post-reading interview before I really understood what the story was saying, although the penny might have dropped had I listened to it one more time. It’s very much snagged my interest in Bartheleme, and if I encounter his books in my travels, I will definitely place them on my reading list. It’s a safe bet that many of us have one or two pieces that don’t conform to the accepted norms, and it can be difficult to find a suitable home for these. One of mine is a work called The Executive Lounge which takes the form of a list of statistics describing a place, but that place only becomes clear in the last two lines. I don’t know whether to classify it as prose or poetry, as a list usually contains line breaks like a poem, but this has the metre of a prose piece. Whichever way you consider it, it’s most definitely for the page, not performance. My only public reading of it so far was in front of an audience who are accustomed to my work, and it’s the only one of my pieces they didn’t understand until I explained it. To date it’s been rejected by several publishers. Regardless, I consider it to be a completed work in which I still have faith. However difficult it is to find a home in a mass-market world, never be afraid to experiment. With an ever-increasing number of small publishers springing up, at least one of them is bound to be on your wavelength. The next time I identify an editor who might appreciate The Executive Lounge, I’ll send it straight to them. If nobody took a risk from time to time, we’d all be reading bland and unchallenging literature. Incidentally, the place I read out that piece was Hotchpotch, an open-mike night for writers rather than musicians. If you live in or near Dundee, the next event is on Monday 20 October at The Burgh Coffeehouse on Commercial Street from 7pm to 9pm. Bring along your best work, experimental or not.